Good afternoon, boils and ghouls! 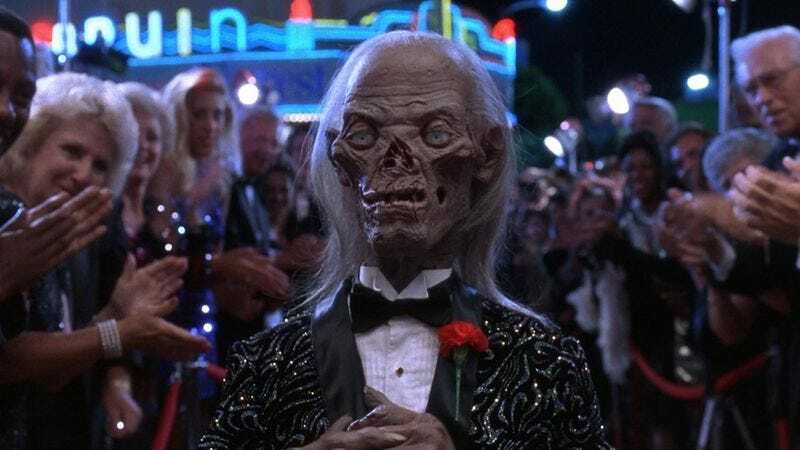 It’s your pal the Cryptkeeper, here to bury your concerns that your slay-vorite horror host won’t be back to punctuate each episode of the revived Tales From The Crypt with my bloodcurdling wordplay! Well, you can take it straight from the horror-se’s mouth, kiddies: This BOO-mor is about as reliable as my first wife…and equally as rotten! Hahahahaha! Why, without yours BOOly, Tales From The Crypt is nothing more than some third-rate horror anthology scare-ies like The Sigh-light Groan or Snails From The Dark-Died! My executive pro-BOO-cer M. Night Shyamalan admitted as much during a panel at WonderCon last weekend, where he said “there will” be a Cryptkeeper on his version of my show, and that the series will follow the classic episodic format! He would have said more, but I made him sign a…GAG order! There’s no stopping BOO love, kiddies! See you on TNT this fall! Hahahahahahahahahahahahahahahaha!